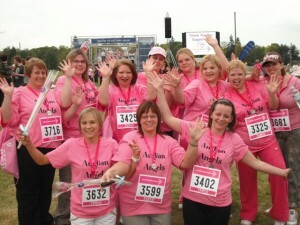 Race for Life is a national event organised by Cancer Research UK since 1994. The concept is simple, complete a 5k course by either running or walking and raise funds through sponsorship. Reasons for participating do vary; some take part due to their charitable pedigree, others due to bereavement of friend or relative through a cancer related illness, but everyone wants to raise as much money as possible to fund Cancer Research UK’s pioneering work. This year Anglian Home Improvements and Anglian Building Products teamed up to complete the course at the Norfolk Show Ground in Norwich on Saturday 2nd May. Fifteen employees took part in the event and raised a fantastic £1714 for charity. Overall 680,000 women took part throughout the UK and raised an astonishing £62.5 million. 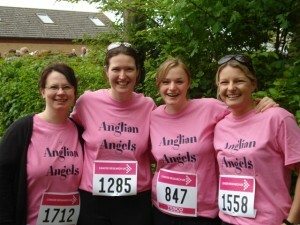 Anglian staff showing off their medals! Kim who took part in the race said ‘It was a great effort by everyone involved, we had alot of fun while raising a substantial amount of money for Cancer Research UK’.